Introducing the StairMaster 7000 PT Stepmill. You won’t believe just how easy it is to achieve the same cardiovascular benefits you’d get on a treadmill, whilst at the same time enjoying a superior lower-body muscle workout too. 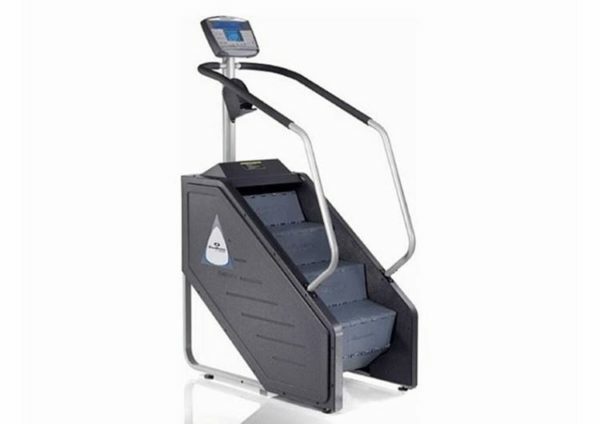 The machine works your heart, lungs, and muscles without jarring your joints, and is outfitted with a patented revolving staircase that offers 8 inch high steps that very closely mimic the feel of genuine stairs. Once you start your climbing workout, it will feel like you’re walking or running up the stairs of your local sports arena or auditorium, but in the comfort and convenience of your own home. You’ll have your choice of several speeds, from 24 to 162 steps per minute, and an electronically controlled alternator will precisely control the pedal descent. Best of all, for the more serious workout enthusiast, the 7000 PT offers a nationally recognized fitness test to gauge individual progress, along with a custom firefighter test (CPAT). Exercise Programs: Quick Start, Manual, Fat Burner, Calorie Burner, Speed Intervals, Heart Rate Zone Trainer. Fitness Tests: Multi-stage Fit Test and CPAT Fire Fit Test. Revolving Staircase with 8″ high steps. Speed: 24 -162 steps per minute (adjustable). Reading Rack, Water Bottle Holder and Accessory Tray. Height: 78 in. Length: 50 in. Width: 29 in. Stepmill 7000 PT for sale, feel free to enquire above.